In 1870 the Christopher Pfeifer family lived in Moulton Township, Auglaize County, with a Moulton post office address. Their household in 1870: Christopher, 50; Fredericka, 23; John, 17; Henry, 11; Kate, 4; Nicholas, 3; and George, 2. Christopher was born in Bayern and Fredericka in Württemberg. All of their children were born in Ohio. The father Christopher was a farmer. Apparently this was Christopher’s second marriage. 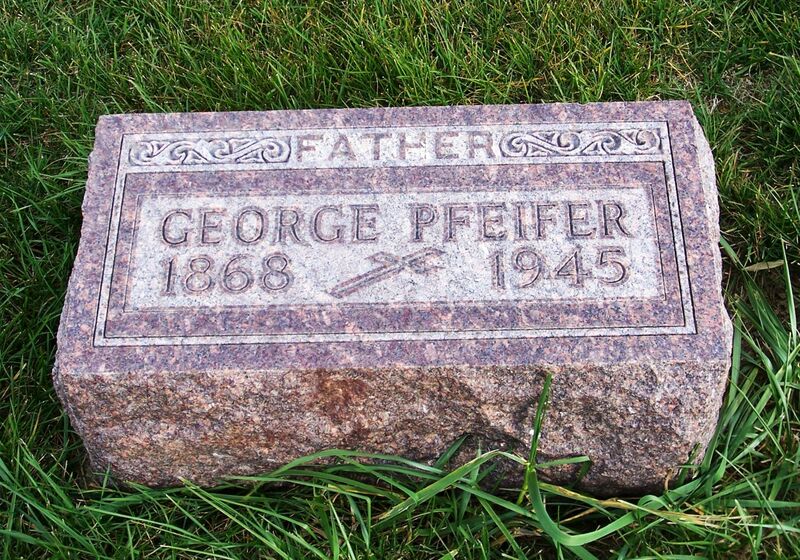 George’s father Christopher Pfeifer died 14 September 1880 and is buried in Zion Cemetery in Moulton. After Christopher’s death George’s mother Fredericka married Nicholas Hoehamer and they moved to the Chatt area, just across the state line, in Adams County, Indiana. That is probably how George Pfeifer came to meet Barbara Kuehm. The Hoehamers were once members of Zion Chatt and several of their children were baptized and confirmed at Zion. George probably attended there, too. Nicholas and Fredericka are buried in Willard Cemetery, aka Mount Hope Cemetery, Adams County, Indiana. I have not located Barbara and George in the 1900 census. George’s wife Barbara died in Van Wert on 25 June 1928 and is buried in row 7 in Zion Chatt’s Cemetery. I am often surprised at the connections to my family that I learn about while writing these blog posts. George’s sister Anna Regina Pfeifer (1871-1911) married Adam Jacob Pflueger (1862-1919). I am related to the Pfluegers on my mom’s side of the family and Adam Jacob Pflueger is my first cousin three times removed. Adam Jacob and Anna Regina are buried in Zion Schumm’s cemetery and I posted their Tombstone Tuesdays some time ago. “Ohio, County Death Records, 1840-2001,” database with images, FamilySearch, George J Pfeiffer, 26 Jun 1945; Pleasant Township, Van Wert, FHL microfilm 1952880. “Ohio, County Marriages, 1789-2013,” database with images, FamilySearch, Christopher Pfeifer and Frederica Kniesel, 11 May 1864; Auglaize County Marriages, Vol.3, p.161, FHL microfilm 963056. 1870 U.S. Census, Moulton, Auglaize, Ohio, p.440B, dwelling and family 139, Christopher Reifer; Ancestry.com; FHL microfilm 552671, NARA microfilm M593, roll 1172. 1880 U.S. Census, Auglaize, Ohio, ED 8, p.450B, dwelling & family 66, Christopher Pfeifer; Ancestry.com; NARA microfilm T9, roll 993. 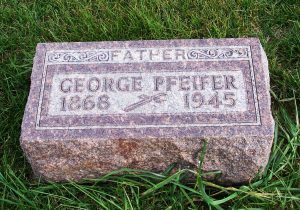 Find A Grave.com, Memorial #23764396, Christopher Pfeufer [Pfeifer], Zion Cemetery, Moulton, Ohio. 1940 U.S. Census, Van Wert, Van Wert, Ohio, ED 81-9, p.10A, house no. 408, visited 237; Kenneth Guinn; Ancestry.com NARA microfilm T627, roll 3163.